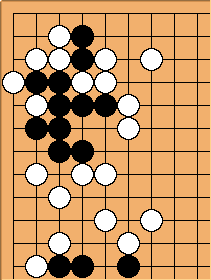 So, here is a problem that Fujiwara-no-Sai solved at a glance provoking Hikaru Shindo's remark. That spoiled a game in children's tournament. Dave Sigaty: I have altered the diagram so that it matches the drawing in the manga. The original was somewhat different. PasserBy? : edited the diagram again according to french edition of HNG. It changes a lot of things in the provided solution. Comments were that even a pro would take time to solve it. No solution is given, of course. Those who read the manga know the first move in the solution, but do they see the implications? The problem is also discussed at Gokyo Shumyo, Section 1, Problem 75 / Solution. The move is White 5 in the main line. ilan: I'm now into my Winter training mode, so I'm riding my bicycle indoors on my trainer, while watching TV to relieve the boredom. Today, I started watching the Hikaru no Go DVD's and I realised that I could try solving the problem by putting it on pause when the position came up. That ended up going pretty well, so I am now much more efficient by doing physical and mental training at the same time.